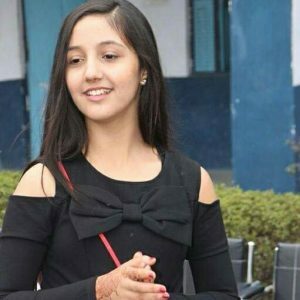 Ashnoor Kaur is an Indian child actress from New Delhi. She is popularly known for her work as young Naira Natik Singhania in Yeh Rishta Kya Kehlata Hai on Star Plus. She portrayed Young Dushala in the television drama series Mahabharat. Her other notable performances include: Devon Ke Dev… Mahadev, Koi Laut Ke Aaya Hai, Tum Saath Ho Jab Apne, Na Bole Tum Na Maine Kuch Kaha and Prithvi Vallabh – Itihaas Bhi, Rahasya Bhi. She earned a Golden Petal Award for the Most Popular child actor and a ‘Nanhe Natkhat Award’ for the TV serial ‘Na Bole Tum Na Maine Kuch Kaha’. Born on May 3, 2004 in New Delhi, India, she is the daughter of Avneet and Gurmeet Kaur. Playing the role of Prachi, she made her first television appearance in Jhansi Ki Rani. *She was born in New Delhi, India on May 3, 2004. *She began her acting career in 2009. *Her favourite Actresses are Katrina Kaif and Deepika Padukone. *Her hobbies include dancing, shopping and reading.